A little over a week ago the Olympics in Vancouver came to a finish, which concluded with the Men’s Hockey final between Canada and the United States. It promised to be epic, and it delivered. Being away from home, I had the ‘pleasure’ of pulling out my big Canadian flag and watching the game with some American friends, although I did wish from time to time that it was a Canadian network (instead of NBC) so that the commentary on the game would have been better. But I digress, it was an epic game, and an epic finish indeed with Sidney Crosby scored the game-winning goal for Canada seven minutes into overtime. Reports since have claimed that it was the biggest event in Canadian sporting history, with 80% of the population tuning in at one point or another. To illustrate the effect of this, EPCOR (the water utility in Edmonton, Alberta, Canada) release a graph showing the city’s water demand while the game was on. It’s amazing to watch the swings between when the game picks up and the end of the periods. The often supplied answer, in some circles, to any question that seems to do with economics is “let the market decide!” However, the limits of what the market can do effectively are rarely discussed. What the market allows is for rational actors to compete for limited resources. Where that falls apart is where one of those assumptions fails: the actors cease to be rational, the actors can’t compete, or the resource (or demand) is not longer limited. And often times, when someone faces an out-of-pocket hospital bill, all three assumptions fail. When someone is severely hurt, it is hard to argue that they are in a frame of mind to make rational decisions; people in the hospital are rarely in a state of mind to ‘comparison shop’ hospitals; and many people value their health to such a point that effectively their ‘demand’ is unlimited (think what life insurance policies pay out…). In short, it seems to me that leaving the market alone to set the price of our health care services is not a bright idea. I value my health and agree that healthcare professionals should be paid well for their services, but I am much more appreciative of healthcare I can actually afford! Toronto has achieved a unique situation in North America; it is a major city that has maintained a dense core of population and employment with a well-functioning public transit system. This combination has made Toronto one of the most liveable cities on the continent. This is a result of years of deliberate decisions to integrate land-use and transportation planning, through policies such as zoning and parking controls, promoting public transportation and bicycle use, and limiting freeway construction. A review of the various policies implanted, as well as their effects where appropriate, is presented, along with conclusions about what has brought Toronto success and how that can be repeated elsewhere. Over the last week, the newswire has been flooded with stories about AIG, first about the retention bonuses it had paid out, and then about the angry backlash. Much has been written about what caused AIG to get in this mess in the first place, and whether or not American taxpayers should be bailing out the company, and so I won’t rehash that, but why is everyone so mad all of a sudden? I think the answer lies in the American Dream. Cheap Oil’s Gone; Now What? What’s right about America is that although we have a mess of problems, we have great capacity — intellect and resources — to do some thing about them. Oil is at an all-time high, and everything seems to be pointing to the price to keep going up. So what does that mean to you and I over the next few years? The Eisenhower Interstate program was brilliant for its day — it created a national system of freeways that crisscrossed the United States, and has done much to provide the infrastructural backbone to today’s booming service industry. But the interstate has in turn caused other problems, including suburban sprawl, funding and mode dependence, and a lack of vision. As a regular reader of the Gateway, I have read a fair share of ideas that are a little thought and controversy producing pieces, but thought I would add a little to the mix myself. I was reading the Editorial entitled “Armoured bears don’t threaten faith” by Ryan Heise in the November 26 edition. Although he raises some valid points, I think he has been rather simplistic and one-sided. I got a kick out of a flyer that came in the mail the other day. The Alberta Cancer Foundation has launched its annual “Cash and Cars” lottery. The flyer starts with a display of the cars, some 26 in all, starting with the SLR McLaren. 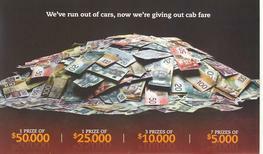 Following is a page for the cash prizes (valued between five and fifty thousand dollars), showing a pile of cash and the tagline “Consider it cab fare”. I guess everyone wins a “car”, even if it’s a taxi ($50,000 will give you quite the taxi ride!). It cracked me up.